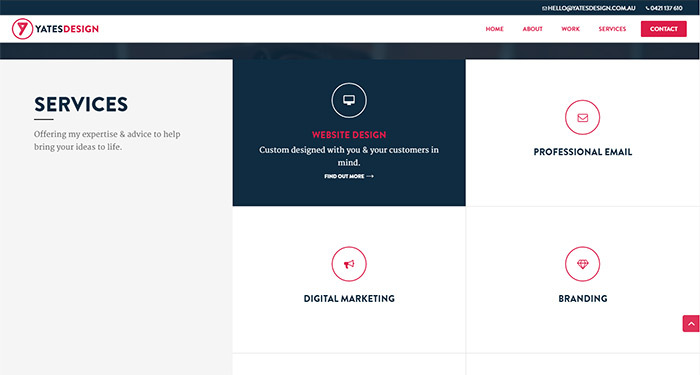 This is a hover effect that I used on the front page of yatesdesign.com.au. In those blocks I used Font Awesome icons as I needed a Drupal icon. In the following tutorial, I’ll use the Divi Blurb module to make things a little simpler. If you’d prefer to just skip the tutorial, you can download the layout and CSS in one handy little zip file. You can add the CSS code to your CSS file of choice or add it to Divi’s Custom CSS section (which can be found in Divi Theme Options > General tab > Custom CSS). To import the layout file follow this post on the Elegant Theme website. This is the blurb description field. You should probably change it. In each column add a blurb module and a button module. The blurb module has the icon, title and text field, we’ll use the button module to handle the link so the link you place in the blurb module isn’t important. Set the link you want in the button module, the button text isn’t important as it will be hidden. Now all we need to do is add the CSS. You can add this code to your CSS file of choice or add it to Divi’s Custom CSS section (which can be found in Divi Theme Options > General tab > Custom CSS.